Along with Windhand, Salt Lake City’s SubRosa have captured the imaginations of fans of doom metal everywhere. By now it’s a cliché, but the whole “female fronted doom metal band” subgenre is loaded from top to bottom with quality bands. SubRosa and Windhand are two that sit at or near the top of the heap, but the subgenres start to blur together when bands such as Witch Mountain, Lucifer, and so on are added to the mix. Soft, melodic, clean vocals sitting alongside a series of cascading, hard hitting riffs and booming percussion forms a striking juxtaposition. The two sounds complement each other very well, and SubRosa take a bit of a softer approach than Windhand. But, the results are just as massive. 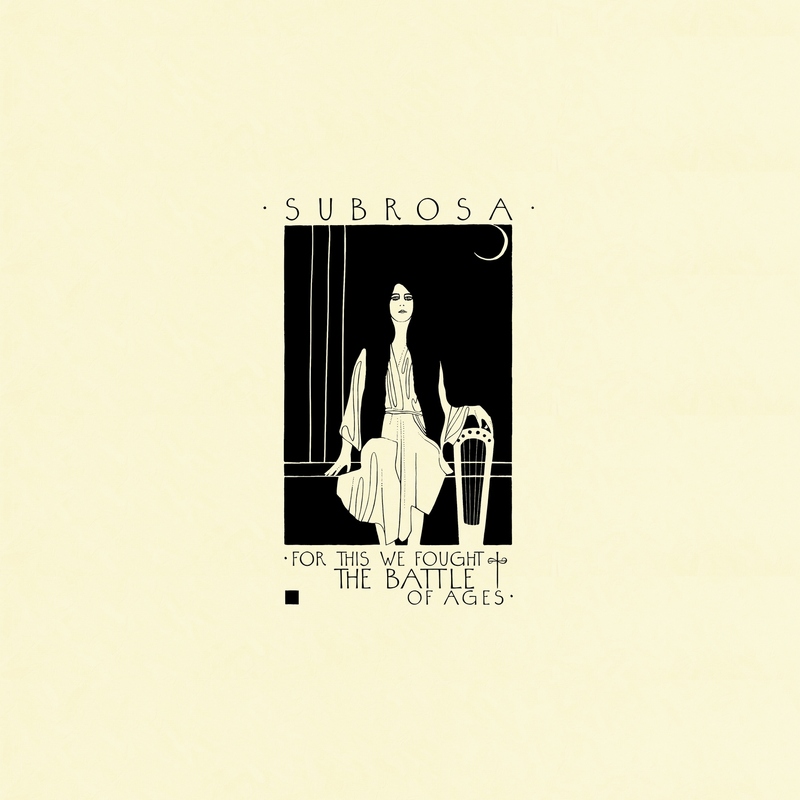 For This We Fought The Battle Of Ages is SubRosa’s fourth full-length album, and it picks up where More Constant Than The Gods left off. Six long songs sprawl out over a running time that exceeds the sixty minute mark, but the listener will never become bored. SubRosa are proficient at weaving together the gigantic riffs and percussion of doom metal with soft melodies. Vocalist/guitarist Rebecca Vernon plays both sides of SubRosa’s sound with her riffing and her vocals, and a dynamic bass is anchored by a mid-paced tempo that occasionally downshifts to a dirge. However, the melodies are greatly enhanced by not one, but two violins that sound partly electrified and distorted, yet are still very clean in their approach. Violinists Sarah Pendleton and Kim Pack expertly incorporate the violins into the riffs and percussion, and Pack performs double duty by occasionally supplying some harsh vocals to accompany Vernon. The third song, “Black Majesty,” is introduced in much the same way. An acoustic piece with vocals from Vernon in Italian, “Ill Cappio,” provides a respite about 45 minutes into the album, but “Killing Rapture” provides weight and heft, and “Troubled Cells” quietly fades to close out the album. SubRosa have delivered an excellent album that wonderfully brings together the hard and soft aspects of doom metal into a melancholic atmosphere. For This We Fought The Battle Of Ages will elevate SubRosa’s profile, and perhaps bring them to the forefront of doom metal as a whole.